Table - An HBase table consists of multiple rows. Row - A row in HBase consists of a row key and one or more columns with values associated with them. Rows are sorted alphabetically by the row key as they are stored. Column - A column in HBase consists of a column family and a column qualifier, which are delimited by a : (colon) character. 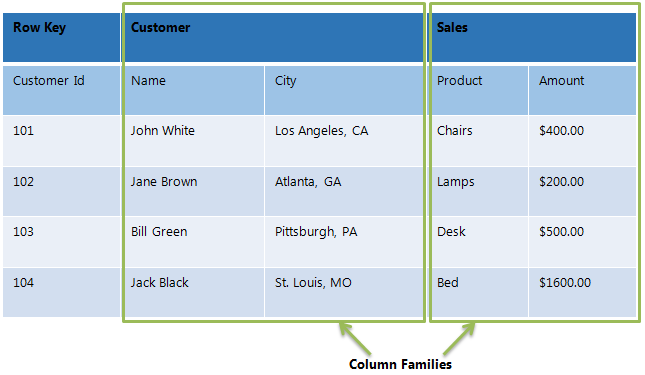 Column Family - Column families physically colocate a set of columns and their values, often for performance reasons. Each column family has a set of storage properties, such as whether its values should be cached in memory, how its data is compressed or its row keys are encoded, and others. Each row in a table has the same column families. Column families are specified when you create your table, and influence the way your data is stored in the underlying filesystem. Column Qualifier - A column qualifier is added to a column family to provide the index for a given piece of data. Given a column family content, a column qualifier might be content:html, and another might be content:pdf. Cell - A cell is a combination of row, column family, and column qualifier, and contains a value and a timestamp, which represents the value’s version. Timestamp - A timestamp is written alongside each value, and is the identifier for a given version of a value. We will create a example exact like above figure, which a table names Customer, with 2 Column Family customer and sales, each Column Family contain 2 columns.